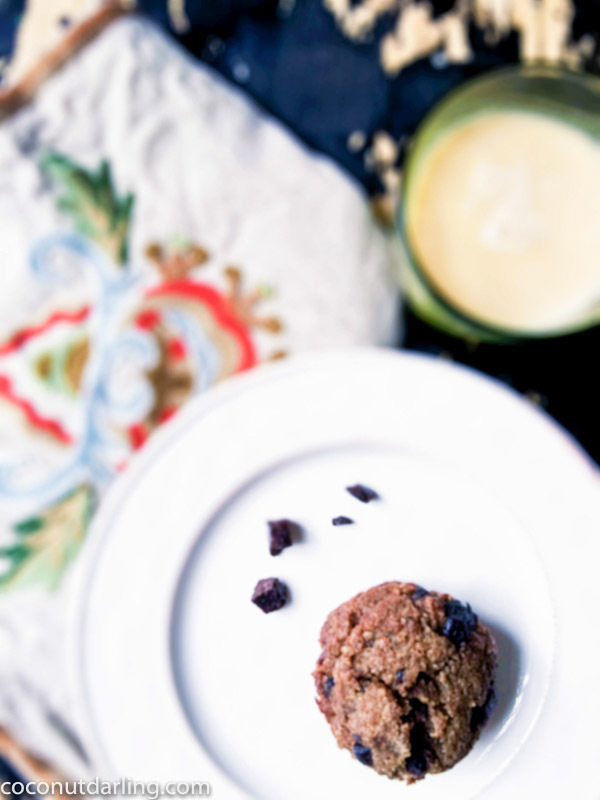 These Gluten Free Carob Chip Cookies are just perfect. Well, to me they are. They were even more perfect before my rambunctious 1 year old decided to place his hands in my prop!!! Not yet, baby! Not yet. I swear no babies were harmed during the making of these cookies!!!! It was jail time for this little man. See the chocolate on his face? Cookie monster. He gets it from his mama. “Chocolate” chip cookies was definately number one on my list to recreate. I can’t live without them. Luckily, carob makes a great alternative chocolate for those of us who are sensitive to it. I make my own “chocolate chips” out of carob powder. I also make my own nut butters and milks with my soaked and dehydrated nuts. You would think I was nuts to be able to have the time to do all of this; but people, it’s really not that time consuming. And it’s for the love of chocolate chip cookies, for pete’s sake!!! When I found out that I was sensitive to caffeine and chocolate my world started collapsing in around me. But you know what? It’s not so bad. I don’t need to depend on coffee anymore. All this clean eating stuff make me feel light and airy and free!!!! (I know that last sentence has many typos…it was on purpose) I swear you will not turn in to a full fledged hippy by eating all of this”stuff”. The best thing about baking egg-free is that you can eat as much dough as you like (not like that ever stopped me before). Doesn’t this dough look amazing!? There was probably a full pan that never made it to the oven. FYI, one of my favorite things to do with (left over) cookie dough is freeze it in bite-size pieces so that you can make cookie dough ice-cream. And don’t forget that tall glass of (almond) milk!! Combine the coconut flour, salt, truvia and baking soda together in medium bowl. Add macadamia nut butter, coconut butter, and date paste and mix until combined. In a small bowl prepare your gelatin egg making sure it's thoroughly dissolved and frothy. Add the vanilla and acv to the gelatin mixture. Combine the two mixtures together until well blended. Mix in the carob chips. Use tablespoon sized scoops. Flatten them with your hand. Space about and inch or two apart from each other. OH MY YUM!!! def gonna make these! how long do I cook @ 350? They are 100% yum!!! 12 minutes should do it. Be careful because carob can burn. I start checking them around 10.
ugh im an idiot and just now see it at the top of the dang recipe!!!! sorry!!! ignore my last reply! I didn’t want to point out the obvious! But it might help to add it at the bottom as well.